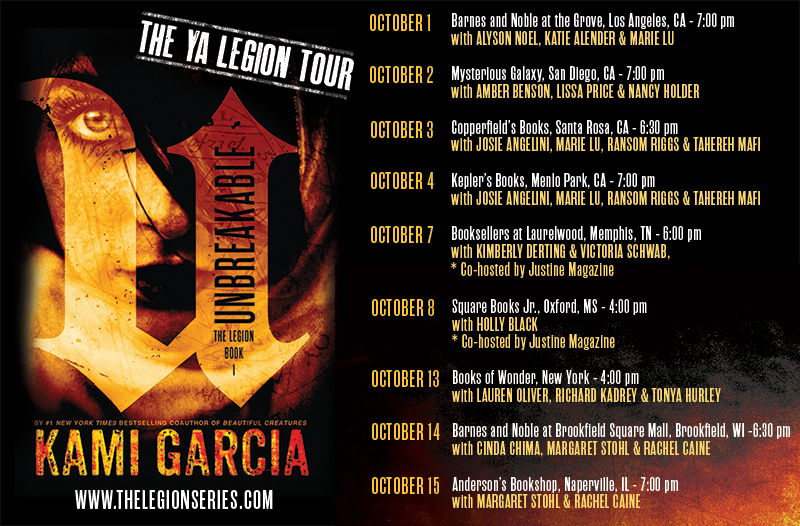 Signing with Kami Garcia at her Launch Party in San Diego for UNBREAKABLE! If you are in the San Diego area, you’re going to want to meet Kami Garcia and come party with us and authors extraordinare Nancy Holder and Amber Benson. This is Kami’s first solo book after the long-running Caster Chronicles series, otherwise known as Beautiful Creatures. Kami was generous enough to give STARTERS a wonderful quote/blurb, and I will always be grateful to her. So when she asked me to join her for this launch, I made the time to trek down to beautiful San Diego. I couldn’t miss it! Come see all of us at Mysterious Galaxy, Oct 2, 7 pm. Kami will be signing her new book and I’ll be signing the Starters paperback and giving out bookmarks. Did you read my page “For Writers?” I have a lot of tips here on my site. This site is WordPress.org and I recommend that. Or go with a tumblr blog.